On 16 June this year, the life of Kiara-Lee Coetzee and her family changed forever. BACKGROUND: She was just 7-years old and diagnosed with brain stem Giloma, or DIPG - Diffuse Intrinsic Pontine Glioma - a cancerous pediatric brain tumour located in the middle of the brain stem. This is no typical cancer. This is the WORST brain tumour in existence. DIPG is very aggressive, inoperable, and incurable. It takes away the ability to walk, talk, breathe, swallow, survive. In the end, children are locked in and all physical abilities are gone, but the tumour does not affect the part of the brain that produces our cognitive abilities, so the child is 100% sane, alert, and mentally aware of the torment while they progress. Kiara-Lee’s cancer lived up to its worst, aggressive, destructive nature. On Friday, 23 November, Kiera- Lee died. She was 8-year old. A week later she was buried. This was only 5 months since her diagnosis. Her parents, Candice-lee and Michael and little sister, Mika are crushed. For her parents, there are also the medical and other over-due bills to worry about. SPONSORING: Roman’s Pizza will pay off Kiara-Lee’s outstanding medical bills of R11 000,00, water and lights arrears of R 18 000,00 and another R6 000,00 for other expenses - a total sponsorship of R35 000,00! Ek kom met n gebroke hart vandag na julle as n mamma van 2 kinders myself. In Junie 2018 is daar 'n 7 jarige Dogtertjie, met die naam Kiara Lee, wat baie diep - nie net in my hart nie - maar by ander regoor Suid Afrika en ander lande se harte gekruip het. Sy is gediagnoseer met 'n baie seldsame kanker bekend as DIPG. Hulle het gesê na diagnose het sy ongeveer 10 maande om te leef. Kiara het nie daardie 10 maande gehad nie en slegs 5 maande gehad. Sy is Vrydag-oggend rustig in haar slaap geneem na 'n lang baklei. Ons Hemelse Pappa het besluit hy het haar meer nodig in Sy Engele kring. Sy was 'n mede-leerling aan my seuns se skool en dis hoe ek haar Facebook page begin volg het en ons deel geneem het aan die projekte wat die skool geloots het. Mamma het vroeer vandag laat weet Kiara se begrafnis is nou Vrydag 30 November 2018 en dat die begrafnis gedek is, maar dat daar nog ander benodighede is. Ek wens ek kon haar en die gesin help. Uit die diepste van my hart vra ek as 'n mamma of julle asb die gesinnetjie sal kan help. Thank you for taking the time to read my e-mail. I would like to ask for assistance. Kiara is a 7-year old little girl in my son’s school (Laerskool Tuine), or she was in school up until 4 months ago. She has just been too sick to attend school. Kiara was diagnosed with DIPG on 16 June 2018 (Her prognoses was terminal and time given by doctors was about 6 months) as it stands today Kiara has been sick for 5 months to the day and her health is not where is should be. It is for that reason that her mom – Candice, who loves her daughter to the moon and back, would like to give her daughter one last family Christmas. I am asking today if there is anything that you can do, help with finances, gifts, pay her rent, water and lights, we really need a Christmas miracle, the idea is to have Christmas early this year on 01 December 2018, drs say that Kiara will not make it until Christmas and if she does it will be a miracle in it self. 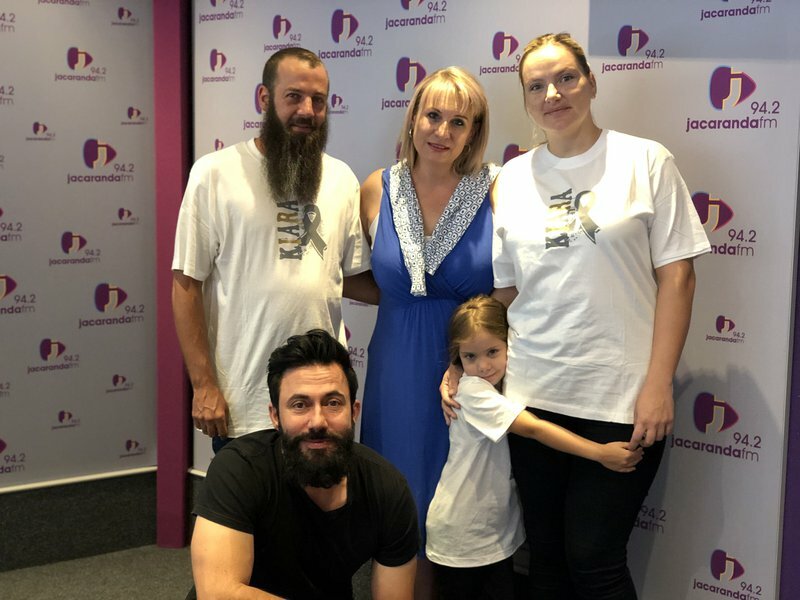 Kiara-lee Coetzee’s is one of two children that I know of that has this dreaded disease in South Africa, the sad thing is that with this type of brain tumour she is fully aware of her surroundings. Please read her story and see it if you can find it in your heart to help this little angel. My name is Candice de Vries, I stay in Pretoria. I've read about this little girl (7) Kiara-Lee Coetzee who has diffuse intrinsic pontine glioma (Dipg), a form of brain cancer. With sadness it was just reported that she only has 3 months left. From my understanding her parents are under sever pressure with regards to Kiara-Lee medical bills. The mom's whole salary goes into Kiara-Lee medication. Is there any way that Good Morning Angels can please bring some relief her parents by some funds. They only manage to raise R23 639.